First on the agenda is a tasty breakfast of my husband’s fried potatoes and eggs. The smell of food cooking brought out the all the birds and squirrels. Every morning and night we were visited by one particular squirrel scurrying from tree to tree and every once in a while daring to venture a little closer onto the fence posts surrounding our campsite. A very curious and beautiful bright Red Northern Cardinal loved to visit us each day alighting on our table and sometimes on our fire pit grill. 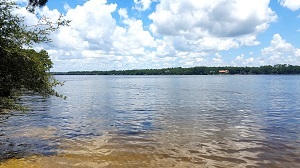 It is July 2018 and my husband, John, and I are camping at one of the premier state parks in Northwest Florida – Fred Gannon Rocky Bayou State Park. Fred Gannon Rocky Bayou State Park is a great place for nature lovers of all kinds with an abundance of wildlife. There are three different hiking and nature trails. The Red Cedar Trail is about .75 miles, the Sand Pine Trail is one mile long, and the Rocky Bayou Trail is 5-miles long. All the trails are great for hiking, birding and nature photography. 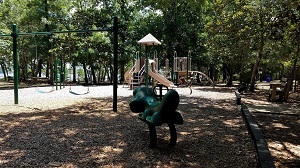 Along the Rocky Bayou shoreline, there are great picnicking pavilions with grills and playground equipment for the kids as well as several stairways leading down to the sandy shore. There is plenty of room for riding bikes around the park. Whether you love fishing or swimming, hiking, nature trails, or riding bikes, this hidden gem has something for the whole family. The park has it all. They have sites for both RV’s and tents. All are spacious and have 20/30/50 Amp power, water, and access to Satellite service and local network channels. The bathroom facilities are centrally located and easily accessible from all 42-campsites. They are both air conditioned and heated. The showers feel great after a full day of hiking, bike riding, nature photography, or canoeing. Washers and dryers are available at the bathhouse. 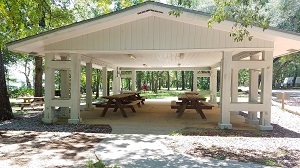 It is a very family friendly campground with separate picnic pavilion and grill areas, children’s playground equipment and a day use area where you can rent canoes or kayaks. The great service that you get from the staff is southern hospitality at its finest. The service is always very professional, friendly, helpful and responsive. Upon entering the park, we were greeted with warm smiles and were provided with all the information we needed about local attractions, restaurants, and other services. They were more than willing and able to answer any and all questions we had about the park and the surrounding areas. This park is extremely clean and well maintained. We were thrilled to stay here for only $16.96 per night including tax. Fred Gannon Rocky Bayou State Park is nestled serenely in the small town of Niceville Florida with Winn-Dixie, Walmart, and Publix and numerous local eateries within a few miles of the park on S.R.20. The resort town of Destin Florida is just a short drive over the Mid-Bay Bridge where there is an abundance of white sugar-sand beaches, restaurants, shopping, water parks, and much more. Rocky Bayou State Park has a very interesting history. 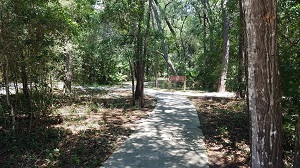 It was established in 1966 when it became part of the Florida Park System after the Civil Engineering group of Eglin Air Force Base completed the road and trail work. However, before that time, the property was used as a training ground by the US Air Force. In 1940, it was ceded to the War Department by the U.S. Forestry Service and during WWII became a major site for bombing and gunnery practice. Remnants of harmless test bombs are still believed to exist on the park grounds. After the war, the property was deemed unfit as a bombing range and, in the late 1950’s, Eglin Air Force Base, under the direction of Colonel Fred Gannon, decided to convert the 600-acres into a public-use area. If you are looking for a great spot to stay for your vacation that is both peaceful and filled with adventure for a great economical price, Fred Gannon Rocky Bayou State Park is a great choice. You can contact them at 850-833-9144 or go online to www.floridastateparks.org for more information.